Quite a lot of walkers – both local and from farther afield - visited the tree-house during my residency and were really intrigued by both the tree-house and the giant nest emerging inside.This work took place at the tree-house itself and took the form of a large ‘nest’ sculpture, which occupied the interior space of Outlandia. My original proposal for Outlandia was given the working title The Human Nest box, as the tree-house’s shape design, construction and site all reminded me of ‘human made’ birdhouses. 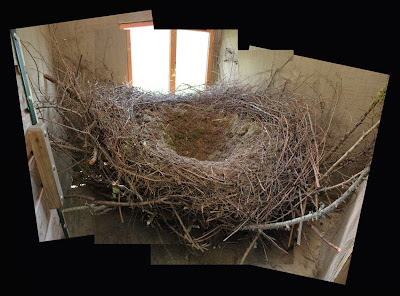 The ‘Nest’ was entirely made from materials found at or near to the site and was constructed in an improvised manner in response to both environment and the interior limitations/possibilities of the space. The height of the interior of Outlandia proved invaluable in enabling long sections of material to be brought into the space. Methods used for construction were very similar to those used by many species of bird, but on a much larger scale and as the nest ‘grew’ the strength and engineering in it’s structure became apparent. When completed. 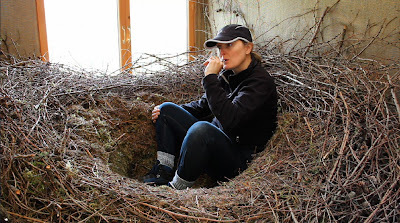 The ‘bowl section’ of the nest was approximately 50cm above the floor of the tree-house, and was capable of holding multiple adult, human occupants with ease. 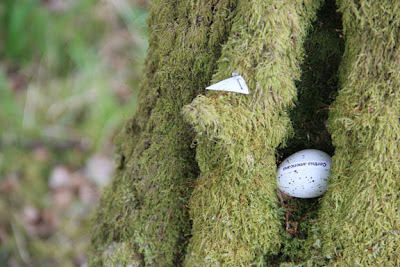 All Materials used were carefully selected so as to not disturb the natural ecology of the forest. I used only dead (fallen) branches, twigs and other materials, and re-distributed these across the area at the end of the residency. 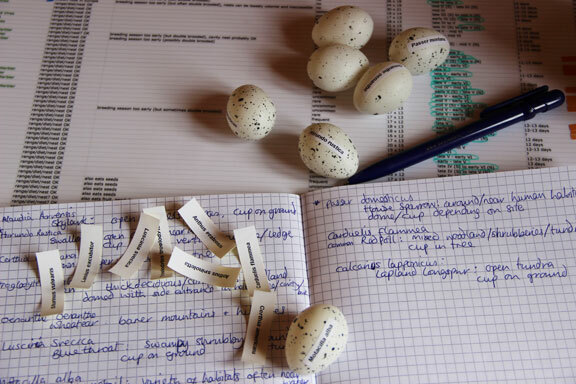 Samples of materials used were documented and catalogued according to the archival process used in previous parts of Cuculus prospectus. These have been cross-referenced against known European and imagined potential North American Cuckoo hosts. This process revealed that the Outlandia nest, shares materials from many of these ‘real and potential’ hosts, but is in reality a hybrid nest formed from the materials used by many of these bird species. Using the calls of 15 species of known Cuckoo hosts that live in both Europe and the New World (North America), I took video footage in which I replicated each of these calls using a boatswain’s whistle whilst in the tree-house (in it’s nest-box form). This part of the work extends part of the project in which the colonial aspirations of Cuculus Prospectus are explored from a colonial/militaristic perspective. At the moment this footage is unedited. Military field operations were explored further through documentation of a repeated action undertaken in various parts of Glen Nevis and on Cow Hill outside Fort William. For this work replica eggs - labelled in the same way that can often be seen in archives of natural history museums and institutions – were placed in ‘appropriate’ New World nesting locations (selected according to data collected as part of Cuculus prospectus), again using the 15 known intercontinental hosts referred to above. This work takes a documentary form and again is ‘in progress’. Whilst at Outlandia I stayed at the log cabin owned by Kenny Ferguson, which was immediately next to the peat track leading up the hillside to the tree-house. This was a totally ideal location occupying the closest possible habitable proximity to the tree-house. I found myself using both the tree-house and the log cabin as a workspace. In the same way that climbers/explorers etc. might use a base-camp. I took large waterproof laminated data-sheets from Cuculus Prospectus with me, and utilised and annotated these in the log cabin throughout the residency with information relevant to my activities. These annotated sheets may in themselves form works that document my process. Another relevant and serendipitous aspect to the residency was that I arrived in Glen Nevis, only days after the first Cuckoos of 2013. The fact that Spring 2013 was so late in starting, meant that, my arrival and planned activities were all the more timely. Cuckoos could be heard throughout the residency calling all along the Glen, and from the tree-house itself.